Lawn care in Lakeway, Texas during winter requires a bit more effort than during other seasons usually because of the cold temperature associated with this period. As it stands, lawn owners have two options when it comes to caring for their lawn – Do-It-Yourself lawn care or hiring a professional lawn care service in Lakeway TX. Both options have their pros and cons, so the average lawn owner is left with the task of making a choice depending on a whole lot of factors. These factors include but are not limited to: the budget available, the services offered, the need of the lawn owner, the topography of the area, etc. As you can see, lawn care is serious business, and we believe every individual who owns a lawn should take it seriously. 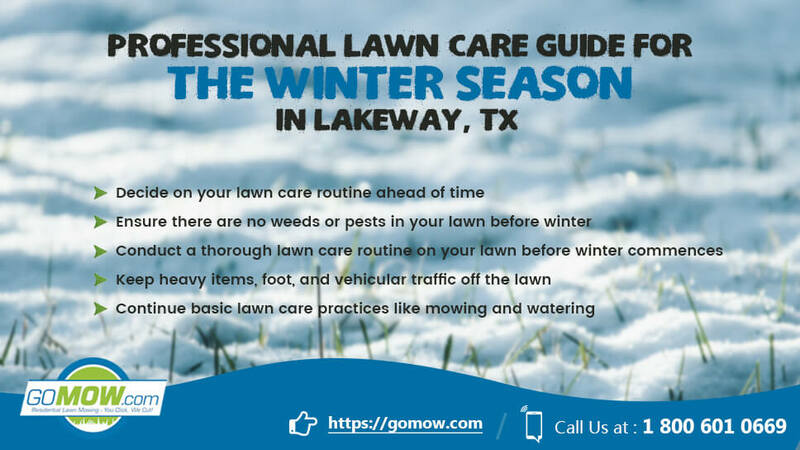 To make the whole process easy for every lawn owner, we have compiled a simple lawn care guide for the winter season in Lakeway, Texas. This professional lawn care guide can be used as a benchmark for many areas in Texas as well. Just before the onset of winter, it is important to decide on the lawn care routine to go for. DIY or hiring lawn maintenance companies to care for your lawn? Whichever the case may be, it is important that you follow up accordingly to have the best results possible. If you enjoy working outdoors and have a bit of free time on your hands, the DIY option can be a great way to exercise and stay active during winter. However, if you are not just up to the task of doing your lawn care, then hiring a lawn treatment company in TX is a great idea. For your lawn mowing needs, consider an excellent lawn mowing service like GoMow Lawn Mowing Service. For your lawn to stay healthy, it should be mostly free of weeds and pests which can cause harm to it. Pests like ants, caterpillar larvae, grubs, rodents, and others are formidable threats to your lawn’s health. While some of them feed on the grass directly, others build homes in your soil causing you problems. In addition, they can also be a nuisance as they disrupt any activities you might want to have on the lawn. Consider engaging a lawn treatment service to treat your lawn for these pesky elements on time before winter. To tackle weed problems, you may simply apply pre-emergent herbicides to stop them from coming up beforehand. Organic products are the best-recommended options to do this as they have little to no harmful effect. Preparing lawn with winter in sight is always a better option than going in without adequate lawn care plans. Lawns that have been cared for during the year will fare better in winter than neglected, poorly-maintained lawns. It is equally important that lawn owners carry out a major lawn care service on the lawn as winter begins. This service should be comprehensive by including all major aspects of lawn care like mowing, weeding, watering, fertilizer application, pest eradication and reseeding/over-seeding as the case may be. If doing these seems way too much, consider hiring a lawn maintenance company in Texas for assistance. For an affordable Weekly and Bi-Weekly price, you will likely get a really good professional lawn service. Grasses that are often walked on rarely grow healthy. Therefore, it is necessary that you keep heavy items and traffic off your lawn even in winter. These grasses are living things, and with constant pressing from walking feet and vehicle tires, healthy development can be a challenge. Lawn owners should consider placing a sign on their lawn to warn people of the lawn where necessary. Cars and machinery shouldn’t also be allowed to be parked on the grass for long periods if possible. Basic lawn care routines like mowing and watering should continue if the grasses are still growing or if there is a lack of moisture on the lawn grass. Watering can be done once a week to keep things moderate and in order. Watering can also keep ice formation in check. Too much cold can be detrimental to your lawn so consider watering as a solution of sorts. In conclusion, caring for your lawn should be taken seriously in winter. As lawn care experts in Lakeway Austin TX, we encourage lawn owners to consider going for professional assistance as often as possible. We hope you enjoyed this guide and wish you loads of luck as you put this information to good use!